If you’re ever around the LyntonWeb office, you would know that I’m a little bit in love with social media. Personally, it’s a great way to keep in touch with friends and family, and easily let them know what’s going on in your life. When it comes to your business, it’s a cost effective way to promote your brand and reach your buyer persona. You’re able to share information about your company, provide valuable industry information, and keep up with the latest happenings that are relevant to your target audience. So let’s say you’re utilizing HubSpot’s new Social Inbox (which can automate posts but still personalize your message), you’re providing relevant industry information, and you’re speaking to your buyer persona. Yet, there’s still something missing. What makes you unique? You know your buyer persona, but does your buyer persona know you? The world would be just a little bit more fun if companies kicked off their shoes and weren’t afraid to show us what really made them unique, their culture, and the diversity of their team. Consumers are more likely to respond and engage with companies on social media that they are familiar with and feel they can connect with on a personal level. Introduce your team on Facebook. This is a great place to start. Start off with introducing the people that your clients will be speaking with, whoever is posting on your social media accounts, and if possible, the people that even started your company! Get creative with it, a few minutes can go a long way in making someone feel comfortable with your company. Do a brief Q&A, make a short video, share pictures of your office, or attach a picture of the team member describing what they do, and 3 things that makes them unique. A great social media channel for this is Facebook and even Pinterest! 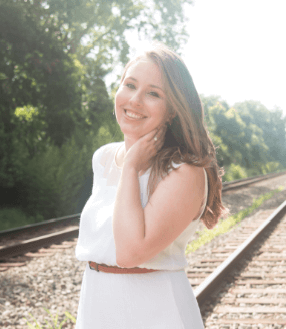 Meet Bridget, LyntonWeb’s Engagement Strategist. Tweet during company trips and events. Attending INBOUND13 was a great experience for the LyntonWeb team, and we made sure to document our journey on social media! We used Twitter to share pictures and videos of us going to dinner, where we were at the conference, we tweeted about prize giveaways, and quotes we were hearing from keynote speakers. It doesn’t have to be a conference out of town, it can be going to Happy Hour, a company wide meeting, or even a picture of a your team at lunch. 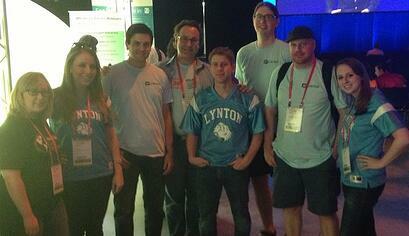 You can check out #TeamLynton at @lyntonweb. Don’t be afraid to make a fool out of yourself. Yep, I said it. Now that you’ve introduced a few members of your team, given them an inside look at your office, and shared with them some company events, it’s a great time to really show who you are and what sets you apart. There’s no judgement here! If your company likes to pretend they are cowgirls or rappers and celebrate National Ice Cream Sandwich Day, share it with the world. Utilizing Vine and Instagram would be a great platform for this. Keep it personal on your blog and website. If you’ve gone out of your way to make sure you are humanizing yourself on social media and giving your clients a good look at who you really are, don’t forget about your website and your blog! Be sure to include an updated website page that introduces your team. Include pics and short bios on what each team member does, and how your clients can contact them. HubSpot also has an easy way to include author bios on your blog, and each time a team member publishes a blog, your readers can get a feel for that author’s personality and writing style. When a potential client takes that next step and gives your company a call or sends an email, it will put them at ease to hear or see a familiar name or face. Have fun with your social media, make it unique, and don’t forget that it’s all about reaching your buyer persona and making them feel comfortable with your company. Do you have any other comments or suggestions on how your company promotes themselves on social media? Write a comment below or share an example with us!